Since we introduced Airbnb’s Data University, the program has continued to thrive and evolve. One improvement has been the addition of team-specific trainings with content tailored to the work of that team. In this post, we describe the impact of this addition and the lessons learned in its implementation. Data University is Airbnb’s dynamic data education program, with the vision to empower every employee to make data-informed decisions. Fifty-five volunteers within Airbnb make up a faculty spanning the Data Science and Engineering organizations to teach over 20 unique curriculums globally each year. Today, three levels of courses are offered ranging from the 100-level series, which provides the foundation for data-informed decision-making at Airbnb, to the 300-level series, which covers data at scale including Bighead, Airbnb’s end to end machine learning platform and Airflow, Airbnb’s tool for automating data pipelines. Since its inception in 2016, over 400 courses have been taught with over 6,000 course registrations! Many of Airbnb’s 4,000+ employees have signed up for more than one course. All courses are taught using anonymized data to ensure user privacy and security. As the numbers suggest, Data University’s existing program structure has successfully trained many employees and upgraded their data literacy. Typically, employees can sign up for any of the variety of classes offered each month and complete the curriculum at their own pace. 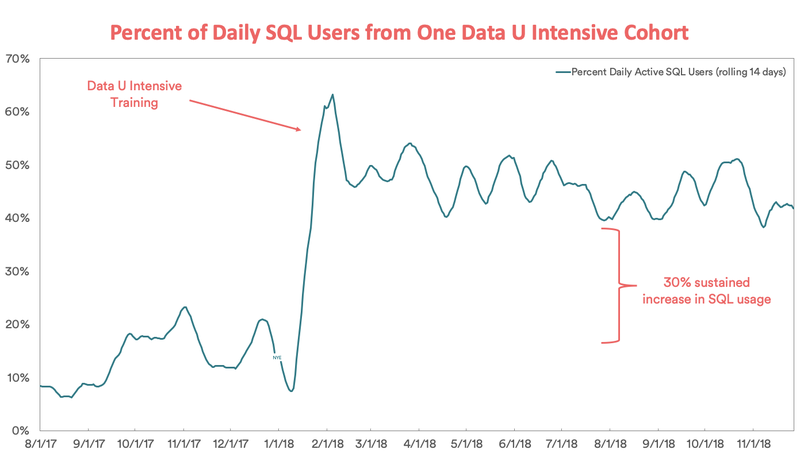 For example, if they want to focus on SQL, they can take the three SQL classes offered over the course of the month or spread it out over several months and take one class each month. Each employee can customize his or her own learning path! Tailoring the content of the training to the specific datasets and needs of a standalone business unit. For example, Airbnb’s Experiences business unit has its own unique set of data, so customizing data training with data applicable to that unit’s daily work makes it easier for students to grasp the material. Training a large group of data champions on the same team. For example, a large, global operations team with many ad hoc data requests which would benefit from more data gurus to supplement the embedded Data Science team. To solve for these, we piloted a team-specific version of Data University, Data U Intensive, taught by the embedded data scientists working with each team. The program covered several of the data foundation classes, SQL and Superset classes, and included an overview of data tables and dashboards specific to each team. The classes were taught in a condensed format over 2–3 days, which allowed participants to clear their schedules and focus solely on Data University. Organizing the classes back-to-back also made it worthwhile for teammates in other offices to fly in to attend. Training an existing, cohesive team created a more comfortable environment for participants and increased their confidence. This resulted in a more engaged classroom as well as more data-related conversation among participants before, during, and after each class. Working with team-specific data and dashboards on team-related problems also helped participants envision how they could use data in their day-to-day jobs and motivated them to stay engaged with the material. Additionally, this was a great way for team leaders to demonstrate an investment in their employees’ career growth. Offering tailored data training for the whole team showed a commitment to helping employees improve their skills and empower them to make data-driven decisions. Data scientists saw a fifty percent decrease in ad hoc requests when the teams they support went through Data U Intensive. When business partners can answer their own questions using basic SQL queries and dashboards, it frees up significant time for data scientists to work on higher impact projects which are crucial for the strategy and direction of their partner teams. Plus, it’s a great opportunity for data scientists to teach! With more people fluent in the generation, use, and application of data, teams are increasingly able to make data informed decisions. Post-training, employees on these teams built their own dashboards and developed localized solutions using data, which Data Science never would have had the bandwidth to create. Participants in the program felt empowered to explore data on their own and use data tools to start measuring their work, which increased their impact and scale. Thus far, we have piloted this format with two major teams: Experiences and Public Policy. In a follow-up survey conducted by Elena Grewal, head of Data Science at Airbnb, both teams were among the top most data-powered teams at Airbnb (behind only Data Science and Product Managers!). Each team had over 80% of members viewing data and using data tools on a regular basis, with the majority saying they now use data for most decisions. These two teams invested heavily in creating self-service data dashboards and reviewed these tools during Data U Intensive trainings. The small Data Science teams working with Experiences and Public Policy were able to scale data-driven decision-making by prioritizing data tools and training. What Made Data U Intensive Successful? There are a few similarities between these two teams which we believe contributed to the success of this model. The first is that each team has a small Data Science team relative to the large number of stakeholders they serve. At Airbnb, this often occurs on global operations teams where there is also the added challenge of varying time zones resulting in limited overlap of working hours. Training many people on the same team at once allowed for teammates to continue practicing and learning together after the courses ended, and to lean on each other for help. Secondly, leadership for each team was committed to making data training a priority. This was a key to success in this format. Leadership must support the team’s full engagement and participation in the program for it to be successful as it is a several day time commitment. Lastly, these teams learned best through team-related examples that used team-specific data. Doing so made the classes feel relatable and kept participants engaged throughout the week. Focusing on how employees could use these tools and skills right away when they went back to their normal roles empowered them to stick with it after the training ended. We hope our experience can help other companies scale data education, to democratize data access and improve data literacy for everyone. Special thanks to Mitra Akhtari, Ellen Huynh, Pauline Glikman, and Pierre Lafortune for teaching Data U Intensive and for your help working on this piece!